Bentley: “Happy Martin Luther King Day and welcome to this week’s edition of BFTB NETWoof News. 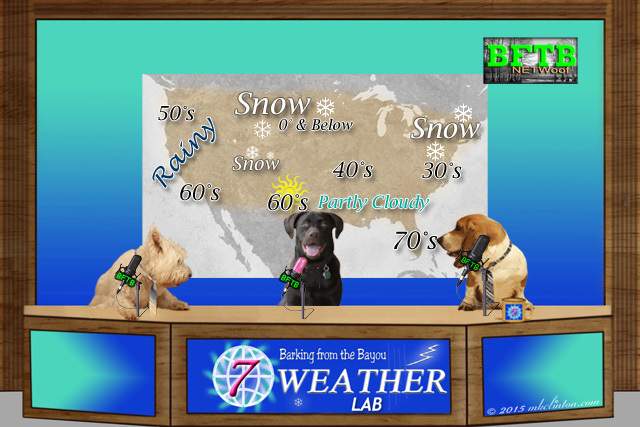 I’m joined, as always, by my co-anchor Pierre Westie and our top-notch Weather Lab Paisley. Each Monday we fetch the good news to start your week with a smile. What is our Top Story, Pierre? Bentley: “I have always liked him. Whenever I start getting paid for my newscasts, I’ll do something cool like that. Remind me to speak to management about our lack of pay. This next story once again highlights the importance of microchipping. A little Chihuahua from Texas somehow made its way over 800 miles to Atlanta, Georgia! Coco weighs in at a whopping 5 pounds and has been missing since September. The Atlanta Humane Society was able to locate the owner by scanning his chip. They even bought her a plane ticket from Texas so she could pick up her little friend. 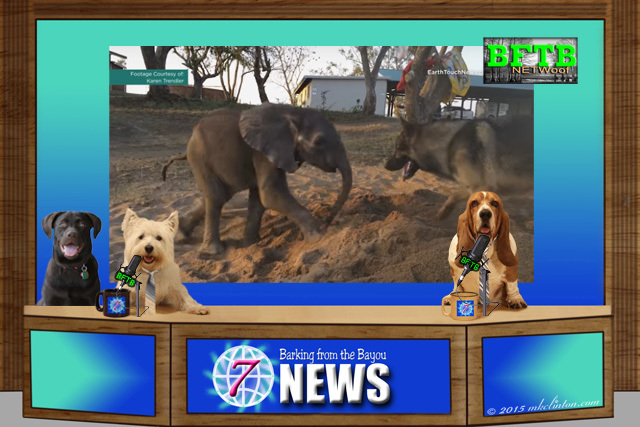 Pierre: “I’ve heard of a dog and pony show, but this is the first dog and elephant story! It made my tail wag. That makes it difficult to report this last story. It appears that the H3n2 dog flu has reared its ugly head in the Seattle area. It is most commonly encountered in doggy daycares and dog parks. If your dog is exhibiting coughing or a runny nose, please don’t take them out in public areas. We urge dog parents to be very careful and try to avoid exposure to their pups. Another great report! Hope you guys have an amazing week! As always, thanks for bringing us a wonderful report!! Kisses to Paisley from Hooh! Great job reporting the current events. We just added the Monday news to our favorites so we can check in every Monday morning. One note on the chipping thing...always make sure your humans update the contact info if you move or change phone numbers. Many people forget and then if you get lost the info is wrong which is a huge problem! There are some flu strains around here too which is what got Bailie and I so sick in November. Scary stuff. Have a howling good week! Wow! It is going to get chilly over there on the Bayou. Though, it is probably perfect temps for romping outside. So grateful to Anderson Cooper, he is a man of the dogs, for sure! And LOVE the dog and elephant story...I did not hear about it but what a great friendship being made there! Thanks for keeping us up to date, pals! Happy Monday! 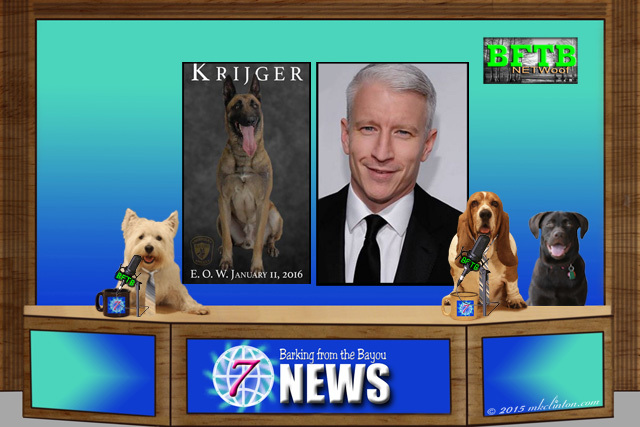 Microchips and Anderson Cooper both ROCK! Thank you to the moon and back for sharing our news on your fabulous blog! You guys ROCK! positive, thoughtful, inspiring and a joy to read. We'll be back. High Paws guys! I just love your Monday newscast and think dat y'all should get paid (in treats) for all of your on air reporting. I also think dat Ellis is super cute. I'd play wiff him. Can you be our agent and get some negotiations happening? Wow, we are amazed at all the news you reported today! Did you know that Ellen got a new puppy? She named it "Kid" so now she can say she and Portia have a kid BOL! YAY for Anderson Cooper! We also saw a pic of one of the lottery winners who took their dog with them to claim the prize. Good thing they did that! What great stories this week! We are especially happy that Sugar is back home. We hope that everyone keeps their sick dogs home in Seattle so that the flu doesn't spread too much. I just love the news when it is all good news. Everyone has inside of him a piece of good news. The good news is that you don't know how great you can be! WE always look forward to the great news stories you bring us! I saw taht about that dog that was killed, but didn't see what AC did - good for him. What a great news cast. That Anderson Cooper is a swell guy. We don't know which story we liked best today, but the fact Sugar is home recuperating and Anderson Cooper's generosity are our top 2! Wow this is super cool. Thank you for all the information and great newscasting. I have to go out now and spread some peemail so I can pass your stories on in my neighborhood. So many great stories today. Thank you Mr. Cooper for what you did for the police dogs! Well i'm glad to hear Mac was reunited!!! Sheesh! That was a great report. Wonderful about the vests for the K-9's.